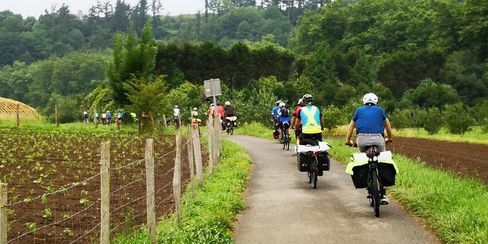 Around twenty cyclists who are participating in the cycling route along the basque whalers’ coast made a stop the past July 2 in Iruin Coder House to regain strength on a journey that began in Irun and ended in Bilbao a few days later. In the Zubieta cider house an excellent tasting of the typical dishes of the Basque gastronomy awaited them and an excellent cider at “txotx”. Ion Astiazaran was responsible for welcoming them and show them the Iruin cellar, a cider house that fuses the traditional roots of their ancestors with the modern skills of current Astiazaran brothers. Iruin collaborates as a sponsor in this adventurous project impulse by Subealabici and in which once again, the organization aims to encourage the use of this two-wheeled vehicle as a sustainable medium, a work that also shares Iruin cider house. Titled “Iceland Land of aventure. After the steps of the basque whalers” Subealabici pretend to unite culture and history touring the basque and Icelandic coast as a tribute to basque whalers who participated in it. The cyclists of the initiative started in Basque Country last June but are currently following their adventure through the fjords of northwestern Iceland, where they are visiting places frequented by basque whalers in XVII century. Once the adventure is over Subealabici will bring even closer the basque people with the icelandic thanks to the edition of a documentary video with the experiences, testimonies and places visited by cyclists.